El desarrollo de este antitanque diseñado sobre la base del tanque ligero M3 empezó en octubre de 1941. El prototipo del vehículo pasó las pruebas de campo en la primavera de 1942, pero nunca se produjo en serie. The T18 is a closed-type tank destroyer with thick frontal armor plating that makes it a tough nut to crack. Its armor gives it a good chance of survival, but it has low hit points if penetrated. It is also quite mobile and has excellent close-range firepower for its tier once armed with the 75mm howitzer. It functions reasonably well as a front line force. 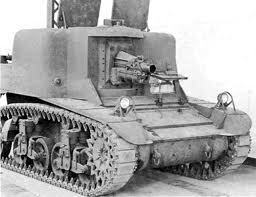 However, if one shoots the T18's gun directly, one has a decent chance of damaging the tank rather than having a ricochet. Circle strafing will more than often not work on this tank unless it is attacked from behind, due to its big gun arc. Just remember that you have poor view range and poor radio range. Close-quarters fighting, however, must be done with caution, and preferably with the tank fully upgraded. Even with the top engine and suspension, this TD is very sluggish when compared with other tanks of its class. In the way of armament, however, nothing can defeat it. Armed with a 75mm howitzer, the T18 can destroy any tier 2 tank in one or two hits, and kill tier 3 tanks with relative ease. Also, the Mk. IX 2-pdr gun is deadly when used at any range and can be very effective when a good player uses its high penetration and accuracy to their advantage.